Trainloads Of Migrants Begin Arriving In Germany : The Two-Way Thousands of refugees, mainly escaping conflict in Syria and Iraq, began arriving in Munich after transiting through Austria. 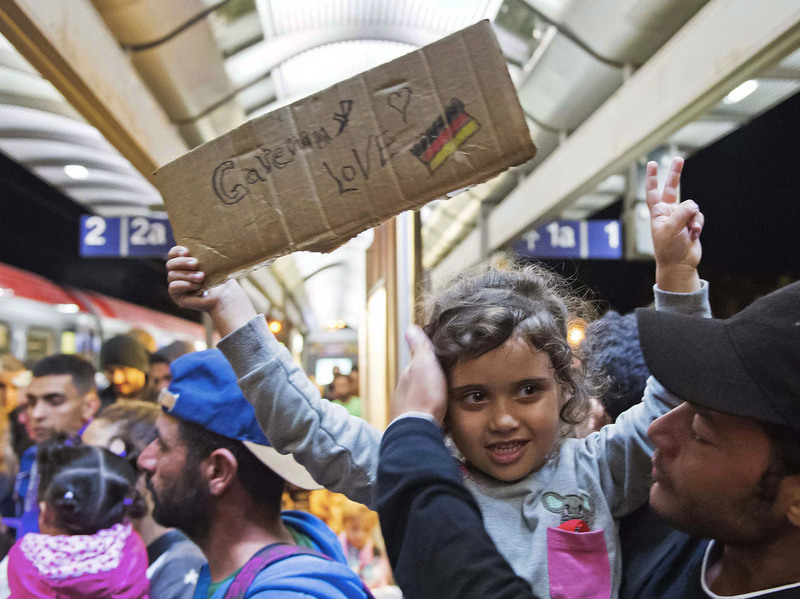 A migrant girl holds a sign expressing her love to Germany as she arrives at the train station in Saalfeld, central Germany, on Saturday. Hundreds of refugees arrived in a train from Munich to be transported by bus to an accomodation center. Thousands of refugees fleeing conflict and economic privation in the Middle East, North Africa and Asia are making their way through Austria to Germany, where they hope to apply for asylum after European nations decided, reluctantly, to open their doors. "Several trains arrived at Munich station in the early hours of Sunday morning, many migrants travelling on to other German cities for processing. "Trains are taking hundreds more to Vienna from Austria's border with Hungary." "The last train carrying an estimated 1,000 refugees pulled into Munich from Austria at 1:30 a.m. on Sunday (2330 GMT), bringing the total to have arrived in the Bavarian capital since Saturday to about 8,000. "Police immediately ushered the arrivals onto another train bound for Dortmund on the opposite platform, cordoned off from onlookers in the main station terminal." However, how long the migrants would keep arriving is unclear, as Austria said on Sunday it would phase out the "emergency measures" it allowed to let them through. Meanwhile, Pope Francis has called on every parish, monastery, religious community and religious sanctuary in Europe to take in one migrant family. The Vatican says it will shelter two families. It's not enough, Francis said, to say "have courage, hang in there" to the desperate migrants moving across Europe. NPR's Eleanor Beardsley is reporting from Hungary, where last week Prime Minister Viktor Orban's right-wing government halted refugees from leaving the train station in Budapest, only to later relent. She says that while the trains are moving again, no one is being allowed to buy an onward ticket to Germany, where most hope to reach. Eleanor tells Weekend Edition Sunday host Linda Wertheimer that the massive migrant crisis is "exposing an ugly underside" in the European Union. "There is not a lot of solidarity in Europe right now. You have France and Germany that are calling for a quota system – that every country shares – and many countries are doing their part. Then you have other countries who say 'no thanks, we don't really want to be a part of that. We can't afford to take any migrants in,' " she says. German Chancellor Angela Merkel announced Saturday that her country would reverse its policy and impose no limit on migrants coming in. By Saturday night, an estimated 6,000 had arrived. In Munich, Dave Blanchard of Oregon Public Broadcasting says as the migrants arrive, "they're cordoned off, they walk to a medical check, and then are taken to a processing center." Dave, tells WESUN that the refugees have been met in Germany by "a handful of right-wing protesters but the vast majority were supportive." He said some "even brought whistles to drown out the right-winger's megaphone." Merkel plans to discuss the crisis with her ruling coalition on Sunday and European Union leaders are set for a Sept. 14 meeting to discuss the grouping's overall response to the situation. There, they are expected to hammer out a quota system in which each member state would commit to taking a share of the migrants.